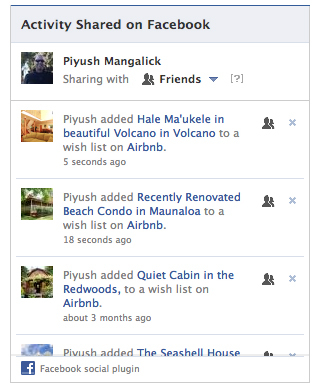 The new Shared Activity plugin on Facebook could help users control who sees their updates. With the plugin, developers can add a widget that would allow users to adjust their Open Graph privacy settings from other websites without having to go back to Facebook from, say, a music app they’re using. Users will be allowed to adjust audience controls and be able to delete statuses and posts. In other words, no more posting to Facebook from a different site, immediately regretting your post, and having to exit the site and go to Facebook to delete the regrettable comment. Now you can just get rid of it directly. “The Shared Activity plugin lists a person’s activities published from your app to Facebook including Open Graph activities, Like button stories, and comment plugin activities. For example, when an individual uses a music app, she could modify the privacy settings, through the plugin, for specific song listening activities, without needing to go back to Facebook to control what’s shown. Similarly, if a person, through a travel app, likes a restaurant or reviews a hotel, and decides that these activities should only be viewable to a select group on friends on Facebook, he can control this within the plugin as well.” The blog post went on to say that the plugin does not control privacy settings within Facebook apps, and is complementary in nature. We are glad to see Facebook introducing features that make it easier for users to control their privacy on the platform. The big question is how many developers will incorporate the plugin into their apps? What other simple tweaks can Facebook make to its privacy setting to make it function better for users? What are some changes you’ve liked and what are some you’ve hated?